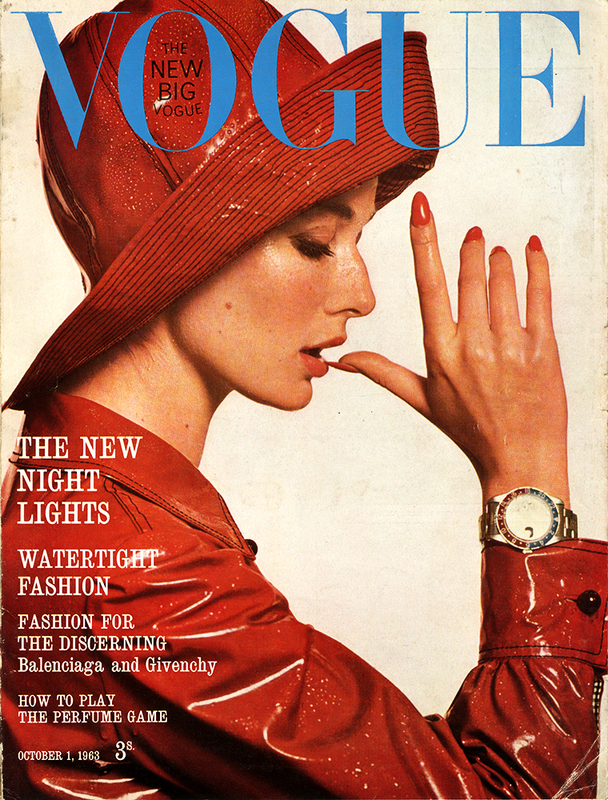 Model Tania Mallet shot by Duffy for Vogue October 1st 1963. Wearing a Mary Quant PVC raincoat with matching hat and Rolex GMT-Master watch. Becoming a model at the age of 16, Mallet’s career spanned 15 years until 1976. Born in Blackpool and the cousin of actress Helen Mirren, she became one of the most recognisable fashion models of the late 50’s to early 60’s. At this point in her career, Tania Mallet was a few months away from filming her big screen debut as Tilly Masterson in the 1964 Bond film “Goldfinger.” Although the film was a massive hit, Mallet returned to modelling and did not pursue her acting career.